WATCH: What If Your Favorite Chocolate Was Turned Into Ice Cream? SPOT.ph) It’s true what they say—chocolates make you happy and excited. Science says so! 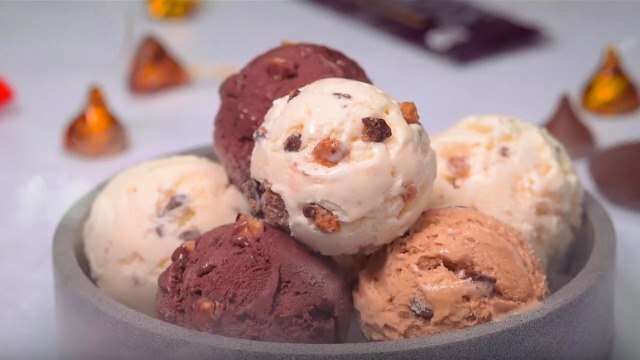 It must be serendipity, but our prayers have been answered: chocolate and ice cream come together in a happy mix with these new ice cream flavors. And not just any chocolate: HERSHEY'S chocolate is delicious already as it is, but becomes even more so in ice cream form. Fair warning when you watch this video: you may experience uncontrollable fits of ooohhing and aaahhing, resulting in immediate ice cream cravings. Take a moment to recover then decide which one you’ll try first: HERSHEY'S Milk Chocolate with Almonds, HERSHEY'S Mini Kisses Salted Caramel, or REESE'S Peanut Butter Cups? Judging from the video, whatever you choose you’ll get the same premium taste and quality of your favorite HERSHEY'S chocolate in ice cream form. Sweet! This article was created by Summit Storylabs in partnership with Selecta Philippines.